God is alone worthy of our worship. Worship is related to every area of our lives. We are called to eat, drink, speak, think and work to the glory of God. Whether therefore ye eat, or drink, or whatsoever ye do, do all to the glory of God. Worship cannot be narrowed down to a particular time and place as if God does not claim authority over certain aspects of our lives. God-centered worship is to be pursued in every facet of our lives as we consider how all-encompassing the gospel is to us. It is nurtured through the gathering of the church in a corporate service, primarily Sunday worship services. Within these venues, we worship God by remembering the gospel through preaching, teaching, singing, praying and celebrating the ordinances of baptism and communion. 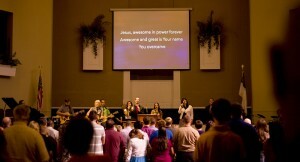 We have two opportunities for corporate worship each weekend on Sunday morning at 9 & 10:45. These are identical services scheduled to meet the demands of the busy culture we live in. On Wednesday night, our student ministries offer a similar worship service and teaching that lead to application in a small group setting. Wednesday nights begin at 7:00pm and end at 8:30pm.